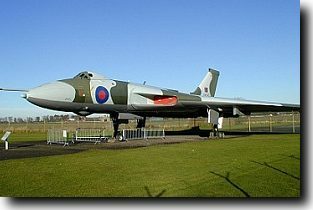 Above is XM597 at Scotland's excellent National Museum of Flight. She entered service with 12 squadron on the 27th of August 1963, then served with 35, 50, 9, 101 and 35 squadrons, including use in the Falklands on Black Buck missions. Retired to East Fortune shortly afterward. She's in excellent condition and very well-maintained, though is purely static, not in running condition. Many panel lines are sealed against the weather and her undercarriage bays have mesh across them to stop birds nesting in there. She was repainted with gloss paint in 1994 to help preserve her too and is kept in excellent nick. Her cockpit is not usually open to the public, but sometimes the museum have special event days such as Air Days in 1997 and 1998, and on those occasions the cockpit was opened up for visitors. Bob's picture taken 3 years after my last visit shows her to be in just as good condition as in 1997!